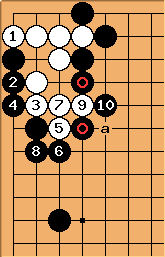 This is the standard joseki for the 3-3 invasion after a 4-4 6-4 corner enclosure. 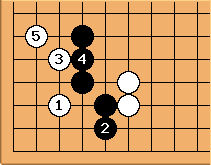 White is alive or will be able to escape at a. 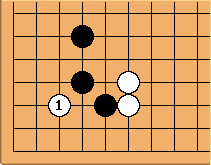 After - , Black can't block at because White will play a and capture either of the marked stones. Of course, going back to the original diagram, this means that if black adds another stone almost anywhere in this area, it forces white to respond with his corner group. If he doesn't, Black's will make the corner a ko for life. NormanP: How would it be a ko in that case? Wouldn't it just kill? Timm(5k): That's what it seems to me too. Timm(5k)/Apr. 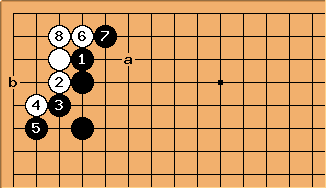 2014: This sequence needs confirmation. Timm(5k): Maybe this also needs confirmation ? This is often seen at lower levels. 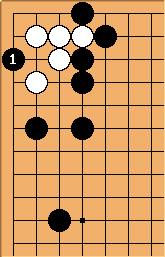 If Black now answers at a, White will comfortably live at b, making a J+1 group. 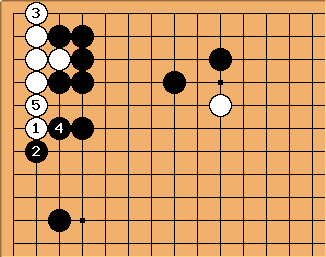 So Black should instead play to kill white and be prepared to handle the cut at a.
Timm(5k): I think White can still escape escape on the side though. 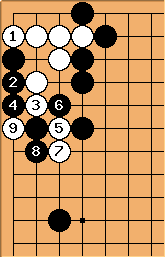 But maybe it's still a good result for Black. 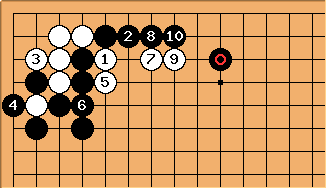 In this situation, the 3-3 point is still available to White. 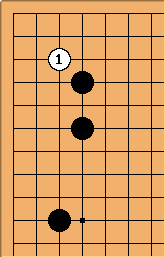 There are three main responses for Black. 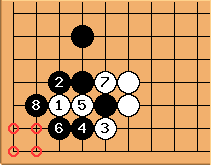 Timm(5k): The sequence needs confirmation. 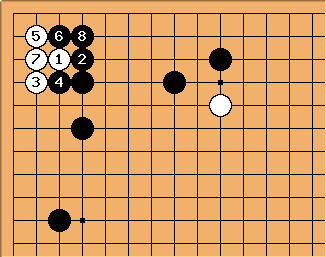 Bray(7k): Guo Juan (5p) includes among her list of mistakes in this position. She covers this in "New Typical mistakes 10k - 1d lecture 3"
tapir: Has she in particular listed as mistake or the sequence starting from ? I was taught this to not play at anymore and/or defend a base in the corner once upon the time. Bray(7k): After , black usually plays or (either is fine). The choice depends on the rest of the board. 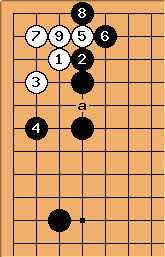 However, she explicitly lists as an error in the sequence shown in this diagram. Reasons include: it's gote, it's small, and white get a strong shape. 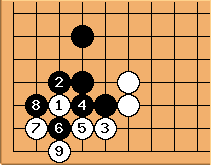 She likes the tesuji itself, but in this instance it's mainly a trick play (white falls to pieces if he tries to save the two inside stones). http://internetgoschool.com/auth/lectures/1116.lecture The whole lecture is quite interesting. I don't have any stake in her site, other than being a member for many years. tapir: No need to justify yourself for relying on Guo Juan (or any professional, really). I am, in fact, a former pupil myself. I agree. 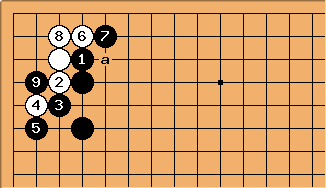 aims at attacking the White stones on the outside, but lets him live in the corner. The third one is the most complicated of all. 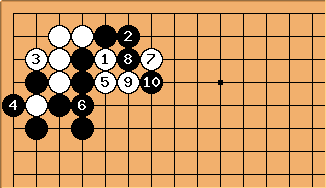 White is able to live too with correct play and the White stones on the outside are not as weak as with the previous variation. Timm(5k): This happened to me in a recent game. 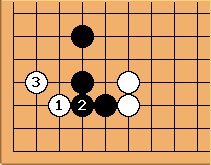 Can white still live in the corner if the peep has been played on the outside ? Andeol? (2k): I can't be completely sure, but I feel like it probably can't.